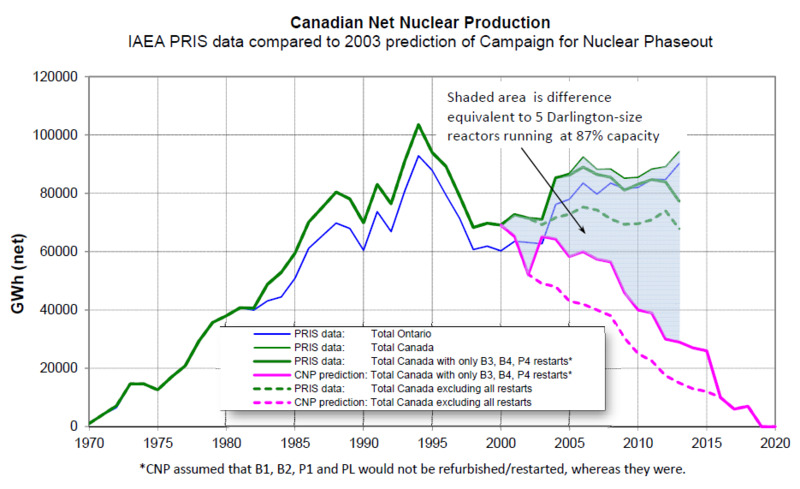 I saw this information posted by Morgan Brown of Canadian Nuclear Laboratories. Data definitions move around from source to source, with different treatments of unit capacity and output. Brown has a preference for gross output and original gross capacity, which are not the metrics commonly seen by non-technical observers. The conclusion, based on 2014 performance data for 19 operating CANDUs in Canada, and 12 international units, is a record for production from CANada Deuterium Uranium reactors (CANDU). Here's how Ontario got down to 7 Mt CO2e in 2014 (see pg 8) from 154 TWh of generation. Only net output data is available from Bruce Power, so it was converted to gross power by an estimated net:gross conversion ration of 94.3%. All data below is gross TWhe, and the capacity factors are based on as-built capacity. 2014 saw an increase in the total output from Canadian power reactors, to the second-highest annual production of 104.6 TWhe, from 18 reactors operating in Ontario and one in New Brunswick. The 12 CANDUs at Bruce B, Darlington and Pickering B produced 70.54 TWhe in 2014, equivalent to a capacity factor (based on the original non-derated ratings) of 84.2%, down from the record high of 74.06 TWhe in 2012 (88.2%). These 12 reactors have been in operation together since June 1993, when the last Darlington unit was declared commercial. To Dec 31 2014 they are an average of 27.3 years old (21.5 to 31.6 years in commercial service); Bruce 5 is the top ranked CANDU for total commercial output, at 193.7 TWhe in its 28.7 year life. The total Ont generation was 99.52 TWhe, up from 95.79 TWhe in 2013. This is the highest ever Ontario generation (99.29 TWhe was the previous record, set in 1994). "Guidance for Q1, coupled with past performance indicates the Company may have entered a death spiral." ...given the size of Yingli's debt, the Company is likely to spend all of 2015 in whittling down its debt to more manageable levels. Due to this reason, we find it unlikely that the Company can keep up with its peer group in terms of cost reductions, sales growth or project build out. Also, more significantly, the Company will be unable to invest in new off-China manufacturing capacity to avoid U.S. tariffs. With JinkoSolar, Trina Solar (NYSE:TSL), and JA Solar (NASDAQ:JASO) set to embark on new tariff-free capacity, we believe that there is a high chance that the Company will be routed from the U.S. market in the second half of the year. Given, the weak situation that the Company is already in, Yingli, in its current form, seems to have entered a death spiral. The Company may survive for the benefits of debt holders and controlling shareholders, but the most common stockholders and ADS holders will likely be wiped out soon. 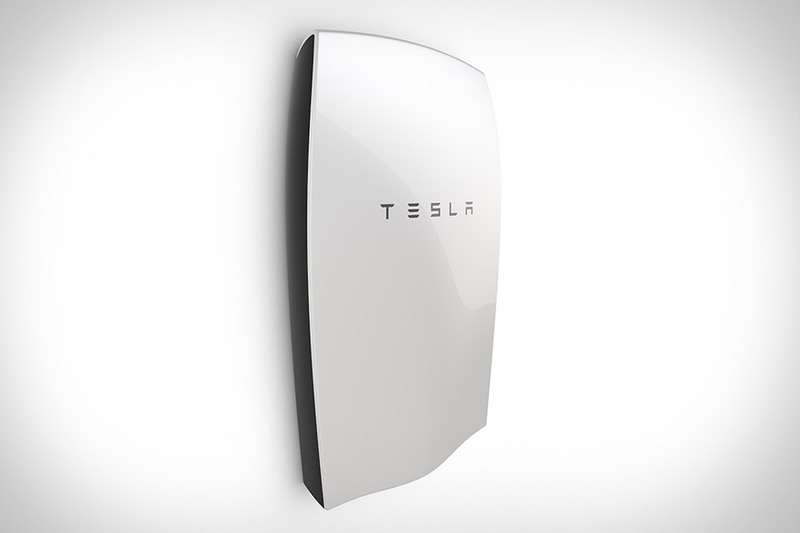 In December Forbes showed Yingli as the #2 solar equipment maker in the world. These things happens in competitive industries, but Yingli's is not the only solar valuation story in the news lately. "Korea would be an ideal market in which to use recycled uranium in its Candu fleet..."
The statement is particularly noteworthy as it comes from Ontario MPP Reza Moridi, Ontario's Minister of Training, Colleges and Universities, during a just completed trade mission to South Korea. SEOUL, May 3 (Yonhap) - Canada wants to step up cooperation with South Korea in the nuclear energy industry as a bilateral free trade deal and Seoul's revised nuclear agreement with the United States provide more room for advanced projects, a senior Canadian official said Sunday. Reza Moridi, head of Ontario's Ministry of Research and Innovation, said South Korea has made "landmark technological achievements" since importing four Candu reactors from Canada four decades ago and is getting ready to team up with Canadian partners to tap into the global market. Korea has played a strong role in the development of nuclear science and technology. I am encouraging Korea and the Ontario Candu energy sector to work together in terms of new reactors and services, as well as various other nuclear technologies in the world," Moridi said in an interview with Yonhap News Agency. Minister Moridi's focus on the promise of recycled uranium is one I share, although the Organization of Canadian Nuclear Industries (OCI) official news release following the trade mission describes collaboration flourishing in many areas, with South Korea, China and India.